In the bowl of a stand mixer, add the water and sea salt and stir to dissolve the salt. Add the flour and yeast and mix with a wooden spoon until the dough becomes a shaggy mass. Make sure that all the flour is hydrated. Using the dough hook attachment, mix on medium-low speed for 4 minutes. Scrape the sides of the bowl and release the dough from the hook. Mix for an additional 4 minutes. It will now hold a round shape. Spray a bowl with nonstick cooking spray or brush lightly with olive oil. Place the dough into the bowl and cover with plastic. Let the dough relax for 15 minutes, and then shape the dough. 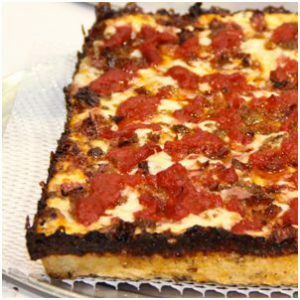 Lightly oil or butter the inside surfaces of a 9-by-13 inch [23-by 33 cm] baking pan or Detroit pizza pan. Place the dough into the pan and use your fingertips to spread the dough out to the corners and sides of the pan. The dough will be sticky, so lightly dip your fingertips in oil to make stretching it easier. Set the pan aside, cover with plastic, and let rise in a warm area for 1½ to 2 hours, or until the dough is approximately ½ to ¾ in [1.5 to 2 cm] tall in the pan. Combine the tomatoes, sugar, oregano, basil, garlic, salt, and pepper and stir together in a medium saucepan. Bring to a simmer over medium heat, stirring periodically. Using an immersion blender or food processor, puree the sauce until smooth. Place it back over medium heat. Simmer the pureed sauce until slightly thickened, 5 to 10 minutes, stirring periodically. Keep the sauce warm for ladling over the pizza, or cool and refrigerate for up to a week. This recipe makes about 3 cups [710 ml] of sauce and it can also be frozen up to 3 months, if desired. You will have more sauce than you need for one pizza. Preheat the oven to 475⁰F [240⁰C]. Sprinkle the Parmesan cheese around the edge of the pizza where the dough touches the sides of the pan. This cheese will form a crispy, caramelized edge on the crust. If desired, place pepperoni in two rows of four down the length of the pizza, directly on top on the dough. Gently push the pepperoni into the dough. Sprinkle the mozzarella and brick cheeses over the surface of the pizza, spreading them all the way to the edges where the dough meets the sides of the pan. This cheese will also contribute to the crispy, caramelized edge on the crust. Distribute red onion strands over top. Season the top of the pizza with a pinch each of oregano and salt. Place in the oven and bake for 15 minutes. Look for an amber-colored top and crispy edges. After removing the pizza from the oven, use a small offset spatula or knife to loosen the sides of the crust from the pan. Slide the pizza out of the pan onto a cooling rack. At this point, if a crispier bottom is desired, you can put the pizza (out of the pan) directly onto the oven rack or a sheet tray and bake for an extra 5 minutes for a slightly more browned finish on the bottom of the crust. After you remove the pizza from the oven, top it with the warm sauce. Traditionally, it is ladled into two rows down the length of the pizza. Serve warm.